This Quadrantid meteor shower sky map shows where to look in the northeastern sky for the shooting star display. Unlike other notable meteor showers, which have peak observing periods that can last days at a time, the most dramatic view of the Quadrantids lasts a few hours. That, combined with the fact that the meteors pass by during wintertime in the Northern Hemisphere – when cold temperatures and other weather conditions can be obstacles – sometimes makes the first meteor shower of the year difficult to observe. One piece of advice: Bring blankets and get comfy. You'll want to dress against the cold December night and sit in a comfortable chair if you plan to spend several hours searching for Quadrantid meteors. "In general, the higher your latitude the better the observing situation," advised Robert Lunsford, operations manager for the American Meteor Society, in a viewing guide. "Unfortunately, in higher latitudes the weather is usually cloudy this time of year. If not cloudy, the bitterly cold temperatures are a constant danger to the exposed observer." The meteor shower will appear to originate from the northeast corner of the constellation of Bootes, the Herdsman. 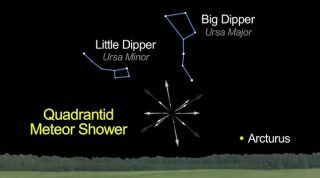 If you're not familiar with the Bootes constellation, look instead for the more recognizable constellations of the Big Dipper and Little Dipper. The Quadrantids should appear to emanate from a point between and below the two star patterns. Astronomers suspect the meteor shower was created by a near-Earth asteroid called 2003 EH1, which could be the debris of a comet that broke apart. The Quadrantids got their name from a now-defunct constellation called the Quadrans Muralis (or "Mural Quadrant"; a quadrant is an astronomical instrument similar to the sextants used for navigation today). "What makes this year so special is that the moon is new on the night of the peak, so there will be no interference from moonlight," said Bill Cooke, an astronomer with NASA’s Meteoroid Environment Office, according to the website Spaceweather.com. That new phase of the moon also sets up another skywatching event – this time, during the day: a partial eclipse of the sun tomorrow (Jan. 4). A partial solar eclipse is what will occur Tuesday. It will be best seen by skywatchers in Sweden, though observers elsewhere in Europe, the northern half of Africa and western Asia should also see the event if the weather allows. This Jan. 4 solar eclipse skywatching guideshows how observers can catch a glimpse of the partial solar eclipse. It is extremely important to remember never to look directly at the sun with binoculars or your unaided eye. Doing so can damage your eyes' retinas and cause blindness. The safest way to view a solar eclipse is to project the sun's image either through a pinhole or through binoculars or a telescope equipped with special filters. At no time should you look through the pinhole or binoculars or telescope at the sun. The Jan. 4 solar eclipse will be the first of four partial solar eclipses in 2011, with the others occurring in June, July and November, according to NASA's eclipse website. Two total lunar eclipses will also occur, in June and December, NASA officials said.